Greg Lemond famously once said that “It doesn’t get easier, you just get faster.” I’ve heard this refrain repeated dozens, if not hundreds of times from fellow cyclists. It is thrown around so much that it’s almost a cliche, but it is also a great motivator for getting through a difficult part of your training. This is not a trip to Disneyland. Training is suffering, and improvement is the reward for all that hard work. I have recently found that the reverse is also true. When you do not train as much as needed, it still doesn’t get easier, you just get slower. When comparing this year and last year’s Mitchell performance, I noticed some startling similarities. Even though my time this year was over an hour longer than last year, my heart rate activity was at about the same rate. Both days I felt worn out when I reached the top, and both days I was achingly sore the next day. 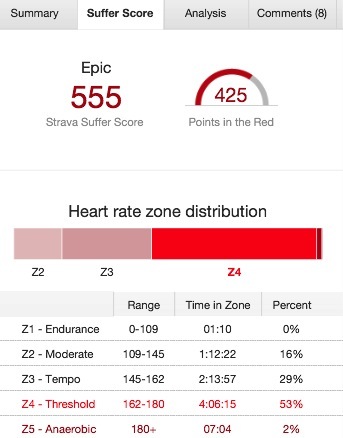 Strava Premium has a useful little tool called Suffer Score. For people like me who are too cheap to invest in a power meter, it’s a good way to measure training intensity. It also a good barometer for how difficult a ride is. When I say that Mitchell is a tougher ride than Bridge to Bridge, I have some evidence to back that up. I have now done Mitchell twice as a Strava subscriber, which allows me to do some comparison. Of course last year I was disappointed with my 7:07 time, and felt I could have done a little better. That may not be fair. When looking at my heart rate stats, however, it looks like I pushed quite a bit. 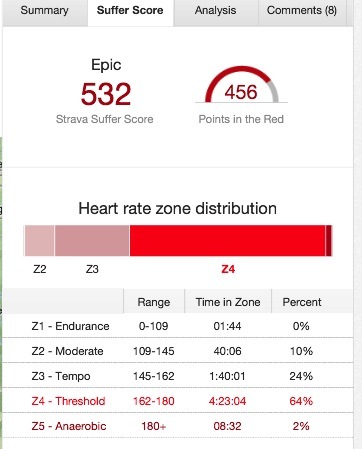 64% of my ride was spent in threshold level, which is quite a lot. My memory is that I worked pretty hard on the rolling hills from Spartanburg to Marion, and tried to control my heart rate a little more on the climbs. If I had drafted more along the way to Marion, the threshold percentage probably would have dropped, but so would my time. It is safe to say that my heart rate was elevated for the vast majority of the climbing. First off, ouch! I believe that 555 is my highest recorded suffer score for any ride. This shows that a slow time is not the only consequence for poor training, not that I could help it this year. The key difference between this and last year is that most of my hard work was at the end of the ride. I had an easier time getting to Marion, so my suffering was again during the climbing. The 4+ hours of saddle time with an elevated heart rate was very close to last year, but the total time was 8:25. It also shows that cardio conditioning is essential training for climbing. Assuming I get healthy and put in more interval training, I should improve not just on this year’s time, but also last year’s. Either way, it is going to hurt just as much, even if it does not take as long. This entry was posted on Wednesday, May 29th, 2013 at 4:27 pm	and posted in Training. You can follow any responses to this entry through the RSS 2.0 feed. Great analysis Aaron. The y-o-y comparison is very telling. Wow, 64%!? Dude, that is quite a lot to be at threshold…Cycling is such an aerobically demanding activity- especially for competitive and racer types. Climbing takes its toll on the body for sure, there is nothing like flat or rolling riding compared to significant and major multiple ascents. Most recreational cyclists and certainly non-cyclists haven’t a clue! 555…”The Number of the Cycling Beast” LOL! A number to live in AA’s infamy! Thanks! The one flaw in Strava’s zones is that they are a pretty wide range. I would wager than in 2012, most of that time in threshold was at the lower range – 162-165, whereas this year was probably more around the 170s when climbing. A power meter is the only way to accurately measure the aerobic (and anaerobic) load. I may break down and get one before Haute Route next year. Agreed that climbing vs. recreational rolling is a different animal, but attacking rolling hills can be good training for climbing. Oh for sure, attacking the rollers is great training! Yea, I hear you on the PM…but they are so damn expensive. Try ebay! 🙂 Or Amazon…Maybe a used one? Anyone in the local club or racing scene by you might have one for sale? Lol, thanks. It might not look fun, but it was a blast.